Goodbye conventional cases, hello sleek and modern bags and totes designed for everybody's must-have work accessory—the laptop. Brought to us by Dan Maravilla and Trent Valladares childhood friends, band mates, and techies turned fashion designers, Hex Laptop Bags and Totes are as functional as they are fashionable for men and women alike. The interiors contain a padded, fleece-lined storage compartment for a 15” laptop as well as one for a tablet—both with Velcro enclosures to prevent items from shifting around. Inside these bags, you’ll also find smaller pockets perfect for pens and business cards. All that, and there’s still a roomy, central main storage area to use as you see fit. 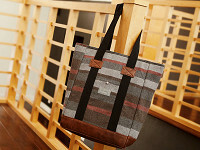 The Hex Tote’s convenient exterior pocket provides easy access to your phone and a snap-enclosure to keep it in place. The Hex Bag features two rear exterior snap pockets for keeping change and small items handy, plus a genuine leather zipper closure on top and a removable shoulder strap. While the Tote features a more classic shape, its styling is anything but ordinary. Both the Laptop Bag and Totes come in your choice of contemporary fabrics like reversed waxed denim, which not only looks and feels unique, but is durable and water resistant. Full grain leather details and surplus grade web handles top it all off. Whether you're heading to and from work or out of town for the weekend, Hex Bags and Totes fit your style and your electronic devices. Amy from The Grommet here filling in for HEX today. We hope you are as excited as we are for these laptop bags to launch! Looking forward to your questions and comments. Are they made in America ?? These bags are designed in the U.S. by the founders and they are manufactured in China. While many of our Grommet partners try their very best to find ways to manufacture in the U.S., it's often just not possible. Despite this, our team is always careful to choose the very best in terms of quality and founder background. We are so happy that our community cares about these values as much as we do. Goodbye conventional cases, hello sleek and modern bags and totes designed for everybody's must-have work accessory—the laptop. Brought to us by Dan Maravilla and Trent Valladares childhood friends, band mates, and techies turned fashion designers, Hex Laptop Bags and Totes are as functional as they are fashionable for men and women alike. The interiors contain a padded, fleece-lined storage compartment for a 15” laptop as well as one for a tablet—both with Velcro enclosures to prevent items from shifting around. Inside these bags, you’ll also find smaller pockets perfect for pens and business cards. All that, and there’s still a roomy, central main storage area to use as you see fit. The Hex Tote’s convenient exterior pocket provides easy access to your phone and a snap-enclosure to keep it in place. The Hex Bag features two rear exterior snap pockets for keeping change and small items handy, plus a genuine leather zipper closure on top and a removable shoulder strap. While the Tote features a more classic shape, its styling is anything but ordinary. Both the Laptop Bag and Totes come in your choice of contemporary fabrics like reversed waxed denim, which not only looks and feels unique, but is durable and water resistant. Full grain leather details and surplus grade web handles top it all off.